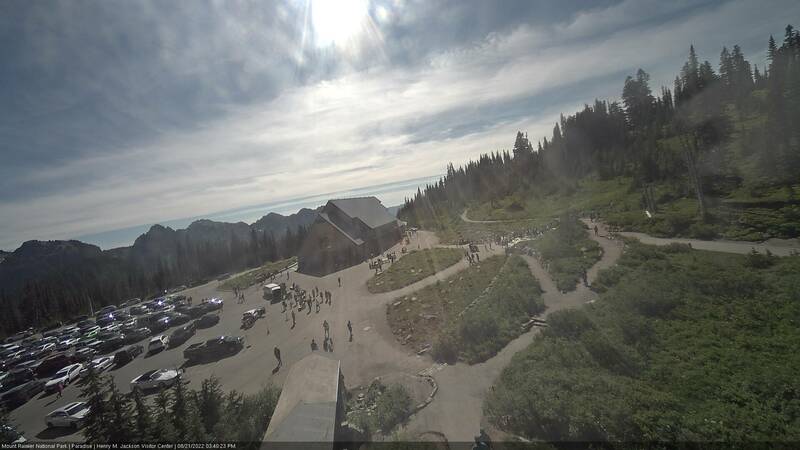 Kudos goes to the NPS staff for their work in adding and maintaining the NPS Webcams for the public. It's a great tool for both them and us. You can click either the link to get the full size image in a tab or browser window, or click the image to get the full size image in a popup window. You will need to have popup windows enabled with your browser. This is one of the newer of the Webcams at Paradise. 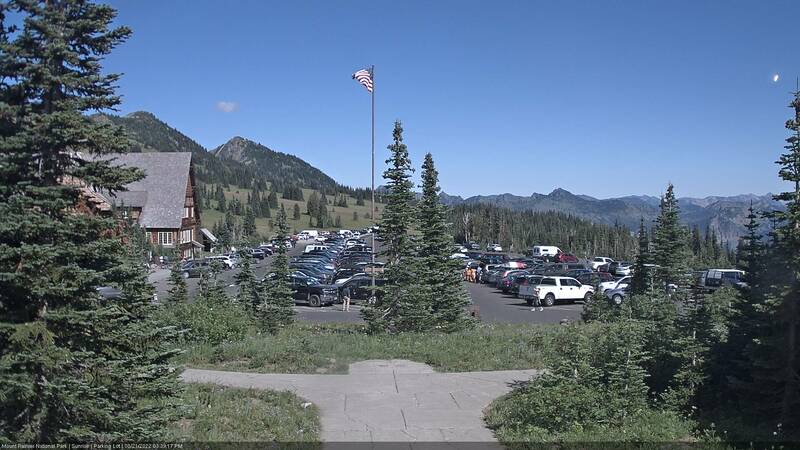 This view is of the Jackson Visitors Center and to the southwest from the Mountain Guide Center on the north side of the parking lot between the visitors center and the Paradise Inn. 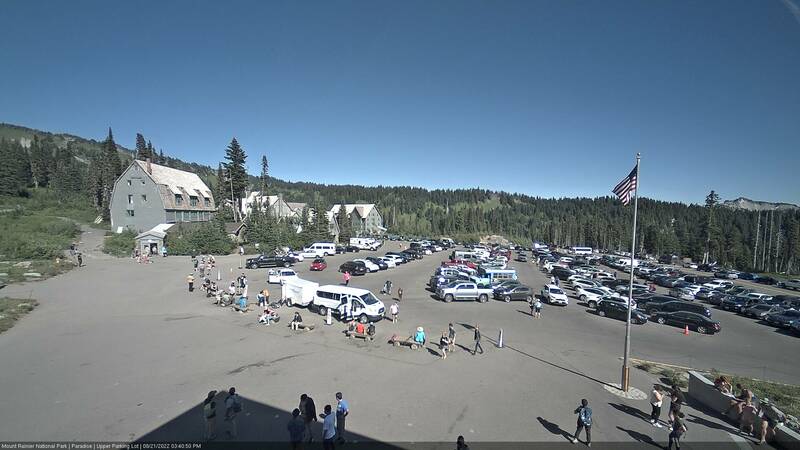 The camera produces a different size image than the Webcams in the Jackson visitors Center. 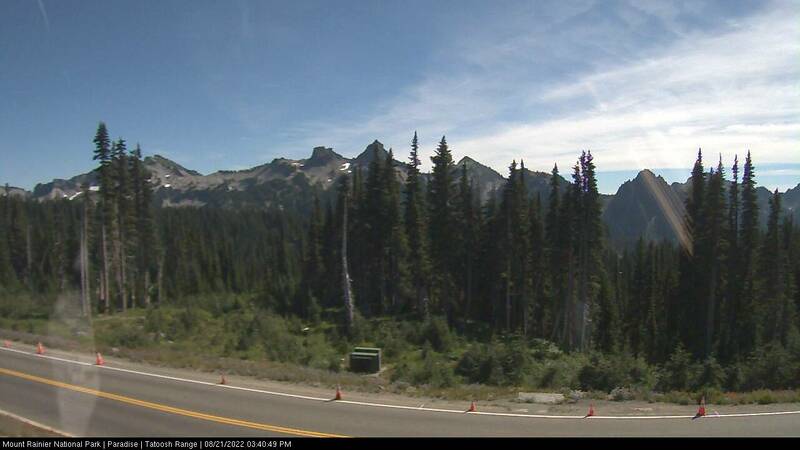 Another Webcam is for monitoring air quality, NPS Web page, or click on the image on the right. 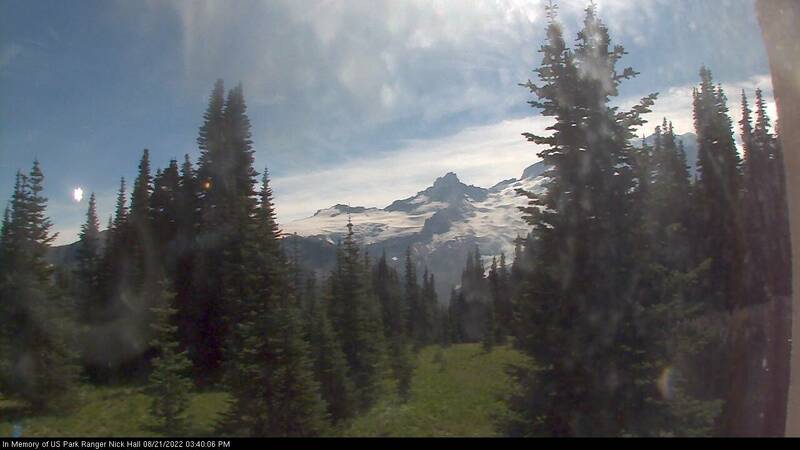 This Webcam is located in the Tahoma Woods Administration building at Paradise west of the Jackson Visitor Center (above Webcams). The Webcam looks southwest with the road from Longmire to Paradise in the lower right corner of the image, and the Web page presents the latest air quality information. 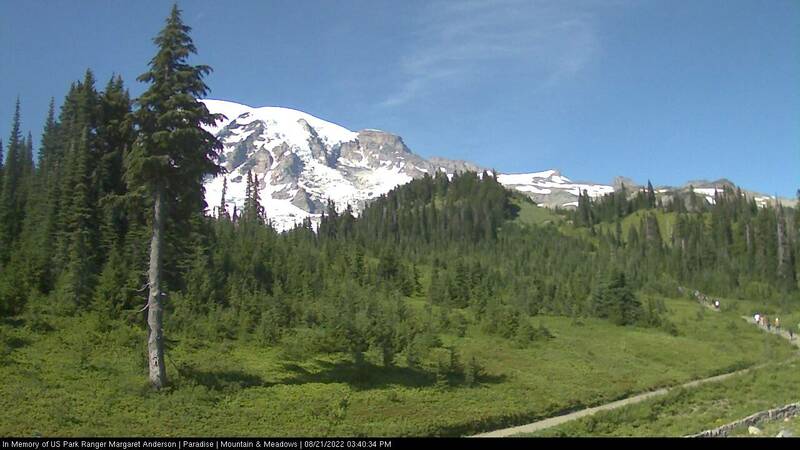 This is one of the new Webcams in the NP. This view is of the Longmire area 6 miles inside the Nisqually entrance in the southwest corner of the NP, the only entrance open during the winter (the Carbon River entrance is a permanent walk-in entrance) and to the southwest at the highway from the entrance. The Longmire Museum and former gas station is on the left in the image and the Longmire springs across the highway behind the forest on the far right in the image. This Webcam is in Mt. Rainier NP at Camp Muir, on the southeast flank at about 10,100 feet elevation. The camera looks due south down the Muir Snowfield and one of the major climbing routes from Paradise. The camera is on the guide service hut, see instrument cluster. One good days you can see climbing groups from Paradise along the left side of the image. This camera is only serviced from the summer to fall season, weather permitting, so for periods the image will be coverd with ice or snow or not functioning. Note the window is half the size (height x width) of the actual image from the camera. This is the newest Webcam in the NP, and while the location hasn't been determined it appears to be in the old Carbon River Ranger station on the south side of the Carbon River just inside the NP entrance. The Webcam is looking northwest with the Carbon River flowing right to left (downstream). This information will be updated when more is known. The Webcams are a 24/7 view and some situations will cause a bad image. The first is if it's dark, it's obvious night, so check the time stamp on the image. 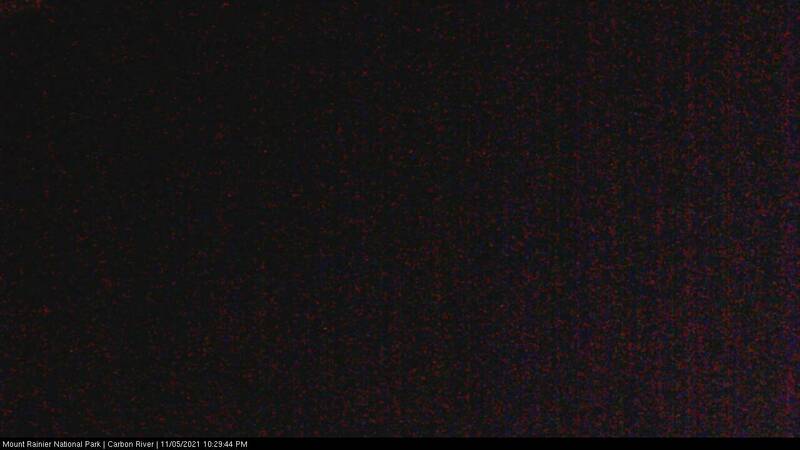 The second is when the camera is down for whatever reason(s) and the NPS will display an old image or a message image. 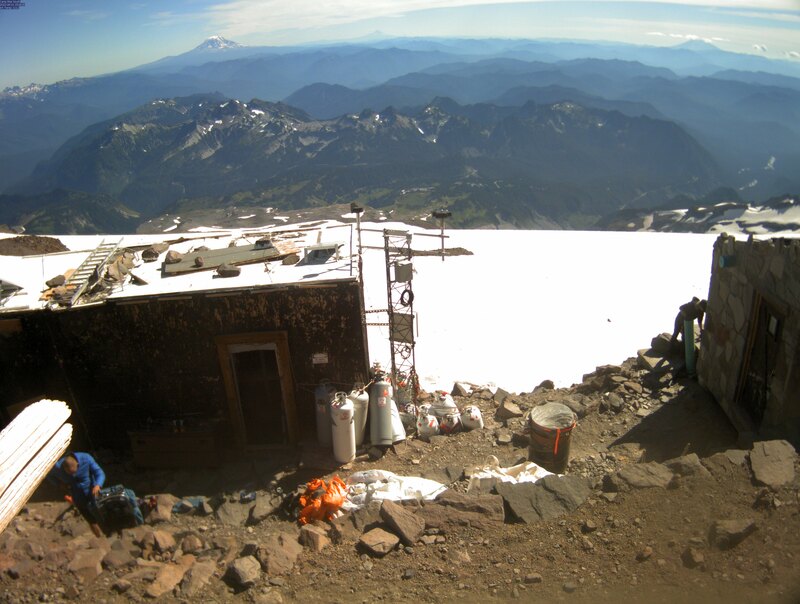 The third, like the one at Camp Muir, is often operated seasonally due to weather conditions. Archive images don't seem to be available at this time. 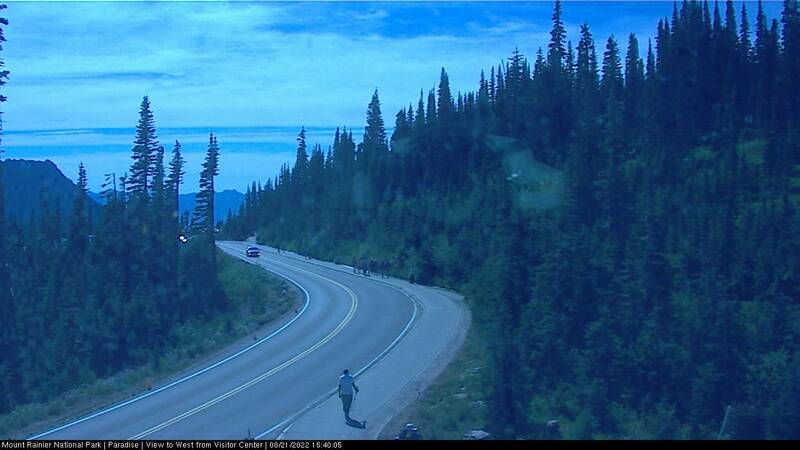 There are other Webcams throughout the Puget Sound area looking at Mt. Rainier or encompassing it in the sweep of the camera across the scene (a Google search will easily return a list). They're not listed here because many are intermitent or not of sufficient quality (distance shot) to be useful for seeing the condition on and around Mt. Rainier. Please use the contact link to send e-mail if you have any questions.